A Great Book to Keep in Your Car – Hippos Can’t Swim and Other Fun Facts | What is ML Reading? Recently after cleaning off the front seat of my car so a colleague and I could go out for lunch, I tossed some books into the back seat. Yes, I confess. I threw books. Don’t tell ML. She knows to treat library books with respect. I wasn’t practicing what I preach. Nevertheless, I learned something from this transgression. Nonfiction books in the back seat have a calming effect on passengers who sit in booster seats. Yesterday, I drove ML and her friend to buy matching outfits for their camp talent show event. (You’ll read all about it next week.) The two books were still on the back seat. I’ve never driven these giggly girls around town as quiet as last night. They were entranced. 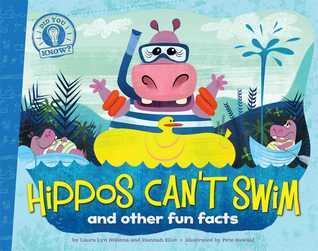 Sarah was immersed in a book called Hippos Can’t Swim and Other Fun Facts by Laura Lyn DiSiena and Hannah Eliot and illustrated by Pete Oswald. Most fact books about animals include photographs. Not this one. Engaging and hilarious illustrations abound. At one point, I heard a little voice in the backseat state, “I can only find thirty-four.” Until I read the book this morning, I didn’t understand the comment. Counting the thirty-five baby bunnies is harder than you think. I haven’t succeeded yet. There are three other books in this “Did You Know?” series…. Chickens Don’t Fly and Rainbows Never End and Trains Can Float. I hope the library purchases all the books in the series. If we don’t enough money in the budget, I vote for Trains Can Float. Perfect for the fact loving, transportation obsessed preschool and elementary crowd. Wait a minute! I just discovered more books in this series are being published in the next few months… Dinosaurs Live On and Saturn Could Sail and Frogs Play Cellos. Any of these books the library purchase will spend two weeks in the back seat of my Honda Civic. ML’s book was from a series call FUN-damental Experiments. A great series I’ll write about soon. This entry was posted in Nonfiction Book and tagged Chickens Don't Fly, Did You Know, Dinosaurs Live On, Frogs Play Cellos, Hannah Eliot, Hippos Can't Swim, Laura Lyn DiSiena, Pete Oswald, Rainbows Never End, Saturn Could Sail, Trains Can Float by mlreads. Bookmark the permalink.